The gîte Navarre gîte is only ¼ mile far from the hot springs of the Roman Baths of Dorres. 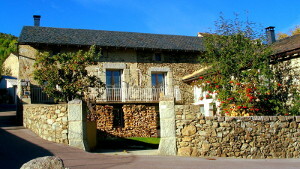 This furnished apartment is an old little mountain farm recently renewed, in the quiet village of Dorres. 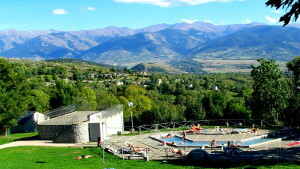 Enjoy all the year round the open-air thermal baths contemplating the dramatic scenery of the mountains. In winter, practice ski and surf at Font-Romeu, a winter resort at 10 miles. Walk with snow rackets along the superb forest ways. Track on long distance footpaths (grande randonnée). Discover Cerdanya in the heart of the Natural Regional Park of Catalan Pyrenees, and its Natural Reserve of Eyne Valley. Visit the roman churches decorated with baroque altarpieces. Angle trouts in the crystal clear high altitude lake of Bouillouses. Practice rock climbing at Targasonne. Visit the CNRS solar furnace of Odeillo, the citadel of Mont-Louis. At Latour-de-Carol railway station, take the tourist train 'Train Jaune'. Reach Spain trekking along the mountain crests. Duty free shopping of Andorra is only 12 miles far from Dorres. This recently renovated House is an old typical mountain farm. It was made of granite stones in the 17th century. The gîte has a surface of 99 m² shared on two levels. It can accommodate up to 6 persons in 3 rooms. It is located in the old and quiet village of Dorres which looks over the mountains. A footpath of ¼ mile leads to the sulphurous mineral water spring at 39 °C. This water is well known to relieve rheumatism and to make the skin softer and healthier. Feel relaxed in the outdoor bath. Enjoy this peaceful surrounding after a walk or a physical activity. The shops of the city of Puigcerdà (Spain) are at 8 km. For tax-free shopping, Andorra is at 35 km. In summer and in winter as well, an entry to the roman spa baths of Dorres costs 5 € per day and per person (reduced price for our guests). It is advisable to stay 20 to 30 minutes in the sulphurous mineral water. This duration is not limited and is left at everybody's free will. At Dorres, a large range of other sports is available to organise a wonderful stay. Hit Ctrl+D to add this site to your favourites.